Images and timing information courtesy of Tom Howe at CED Magic. This two-part episode delves into the history of the Enterprise under a different captain and crew. 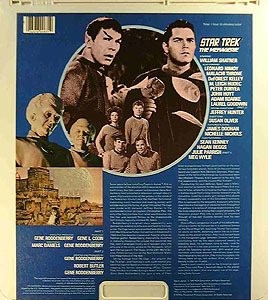 Mr. Spock (Leonard Nimoy) is accused of mutiny when he takes control of the Enterprise and kidnaps the former starship commander, Captain Christopher Pike (Jeffrey Hunter), who has been horribly disfigured and paralyzed in an accident. Spock sets the ship on a course for Talos IV, a planet ordered off-limits under penalty of death. He then turns himself in for court martial, leaving Captain Kirk (William Shatner) to face the possibility of sentencing his First Officer - and best friend - to death. Years before, when Pike commanded the Enterprise, the Talosians kidnapped him to strengthen their race. They used a human girl, Vina (Susan Oliver), the survivor of an earlier ship crash on the planet, to tempt him but Pike refused to cooperate, making the Talosians realize that humans were of little use to them. This is a very loose story summary, but one that was printed on the back of the jacket. 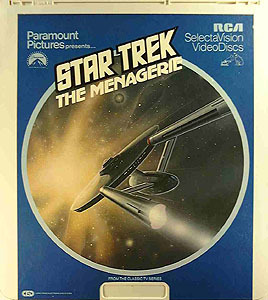 This LaserDisc was issued prior to the mass release of the balance of the STAR TREK episodes, which began in 1985.